Description: Game cartridge includes a photometric light sensor. 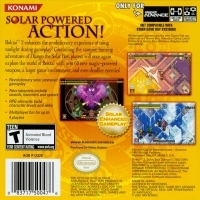 Box Text: SOLAR POWER ACTION! 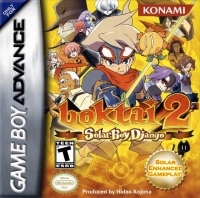 Boktai 2 enhances the revolutionary experience of using sunlight during gameplay! Continuing the vampire hunting adventures of Django the Solar Boy, players will once again explore the world of Boktai with over 60 new magic-powered weapons, a larger game environment, and even deadlier enemies! This is a list of VGCollect users who have Boktai 2: Solar Boy Django in their Collection. This is a list of VGCollect users who have Boktai 2: Solar Boy Django in their Sell List. This is a list of VGCollect users who have Boktai 2: Solar Boy Django in their Wish List.